Use the Microsoft Intune management extension to upload PowerShell scripts in Intune to run on Windows 10 devices. The management extension enhances Windows 10 mobile device management (MDM), and makes it easier to move to modern management. End-user computing is going through a digital transformation. Classic, traditional IT focuses on a single device platform, business-owned devices, users that work from the office, and different manual, reactive IT processes. The modern workplace uses many platforms that are user and business owned, allows users to work from anywhere, and provides automated and proactive IT processes. MDM services, such as Microsoft Intune, can manage mobile and desktop devices running Windows 10. The built-in Windows 10 management client communicates with Intune to run enterprise management tasks. There are some tasks that you might need, such as advanced device configuration and troubleshooting. For Win32 app management, you can use the Win32 app management feature on your Windows 10 devices. The Intune management extension supplements the in-box Windows 10 MDM features. You can create PowerShell scripts to run on the Windows 10 devices. 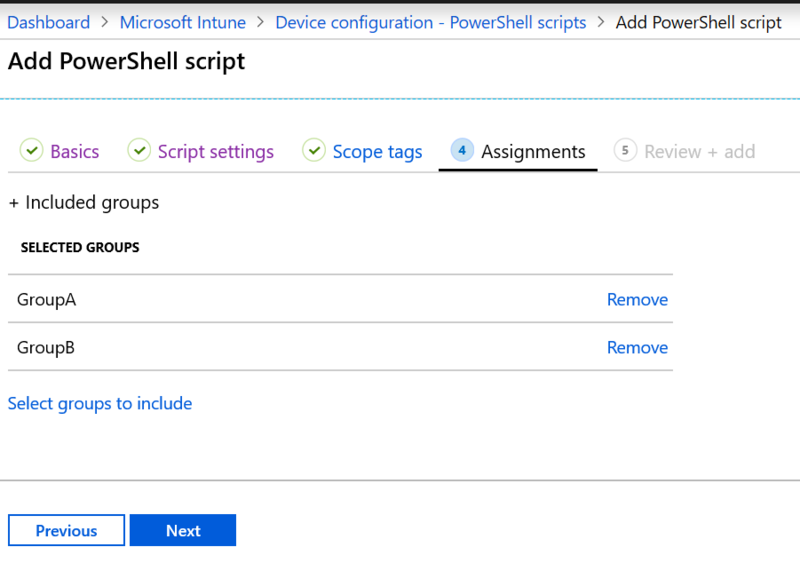 For example, you can create a PowerShell script that does advanced device configurations, uploads the script to Intune, assigns the script to an Azure Active Directory (AD) group, and runs the script. You can then monitor the run status of the script from start to finish. Devices must be joined or registered to Azure AD, and Azure AD and Intune configured for auto-enrollment. The Intune management extension supports Azure AD joined, hybrid Azure AD domain joined, and co-managed enrolled Windows devices. Devices must run Windows 10 version 1607 or later. The Intune management extension agent is installed when a PowerShell script or a Win32 app is deployed to a user or device security group. Name: Enter a name for the PowerShell script. Description: Enter a description for the PowerShell script. This setting is optional, but recommended. Script location: Browse to the PowerShell script. The script must be less than 200 KB (ASCII). Run this script using the logged on credentials: Select Yes to run the script with the user's credentials on the device. Choose No (default) to run the script in the system context. Many administrators choose Yes. If the script is required to run in the system context, choose No. Enforce script signature check: Select Yes if the script must be signed by a trusted publisher. Select No (default) if there isn't a requirement for the script to be signed. Run script in 64-bit PowerShell host: Select Yes to run the script in a 64-bit PowerShell (PS) host on a 64-bit client architecture. Select No (default) runs the script in a 32-bit PowerShell host. No 32-bit 32-bit PS host supported Runs only in 32-bit PS host, which works on 32-bit and 64-bit architectures. Yes 64-bit Runs script in 64-bit PS host for 64-bit architectures. When ran on 32-bit, the script runs in a 32-bit PS host. Runs script in 32-bit PS host. If this setting changes to 64-bit, the script opens (it doesn't run) in a 64-bit PS host, and reports the results. When ran on 32-bit, the script runs in 32-bit PS host. Select OK > Create to save the script. Select one or more groups that include the users whose devices receive the script. Select to assign the policy to the selected groups. End users aren't required to sign in to the device to execute PowerShell scripts. PowerShell scripts in Intune can be targeted to Azure AD device security groups. PowerShell scripts in Intune can be targeted to Azure AD user security groups. The Intune management extension client checks once every hour and after every reboot with Intune for any new scripts or changes. After you assign the policy to the Azure AD groups, the PowerShell script runs, and the run results are reported. Once the script executes, it doesn't execute again unless there's a change in the script or policy. You can monitor the run status of PowerShell scripts for users and devices in the Azure portal. Agent logs on the client machine are typically in \ProgramData\Microsoft\IntuneManagementExtension\Logs. You can use CMTrace.exe to view these log files. In PowerShell scripts, right-click the script, and select Delete. The PowerShell scripts don't run at every sign-in. They run only after reboots, or if the Microsoft Intune Management Extension service is restarted. The Intune management extension client check once per hour for any changes in the script or policy in Intune. Go to Settings > Accounts > Access work or school. Select the joined account > Info. Under Advanced Diagnostic Report, select Create Report. Open the MDMDiagReport in a web browser, and go to the Enrolled configuration sources section. Look for the MDMDeviceWithAAD property. If this property doesn't exist, then your device isn't auto enrolled. Enable Windows 10 automatic enrollment includes the steps. Confirm the Intune management extension is downloaded to %ProgramFiles(x86)%\Microsoft Intune Management Extension. Scripts don't run on Surface Hubs. Check the logs in \ProgramData\Microsoft\IntuneManagementExtension\Logs for any errors. For possible permission issues, be sure the properties of the PowerShell script are set to Run this script using the logged on credentials. Also check that the signed in user has the appropriate permissions to run the script. If it succeeds, output.txt should be created, and should include the "Script worked" text. Monitor and troubleshoot your profiles.